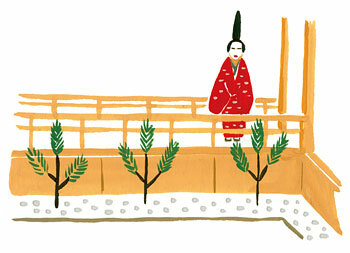 TRIVIA of Noh : Q56 : Is the distance of the bridgeway fixed? | Home | Trivia | Q56 : Is the distance of the bridgeway fixed? Is the distance of the bridgeway fixed? Noh plays have been performed on a special type of stages for ages of its long history. In our time, stages are sometimes contained in theatre buildings, sometimes in the open air, and sometimes built as temporary constructions. The size of the stage is almost fixed for a square of 5.45 m, which is a regular dimension established in the Azuchi-Momoyama period (1568-1603). However, the actual size of each stage slightly differs. The bridgeway connected to the stage plays an important part of a performance, but there is no rule of its width and distance. A standard distance is between 11 and 13 meters, but there are a lot of small-scale Noh stages with rather short bridgeways. Several pieces have scenes featuring actions or dances on the bridgeway, but even for the same piece, or by the same performer, the actions are fine-tuned with regard to the distance. If actors exit slowly via the bridgeway, the aftereffect will be different according to its distance. The difference of the bridgeway's distance is deeply concerned in the way of the performer's expression.